Constructed of spun aluminum with an antique brass finish. Leather handle has name band for engraving name. 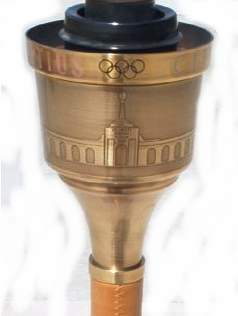 Torches were numbered sequentially and inscribed with the Olympic motto, Citius, Altius, Fortius. The 22-inch (56-centimeter) torch weighed two pounds, four ounces (one kilogram) and was fueled by hospital-quality propane which could burn up to 50 minutes. The flame was wind resistant up to 40 miles per hour and could also withstand light rain. 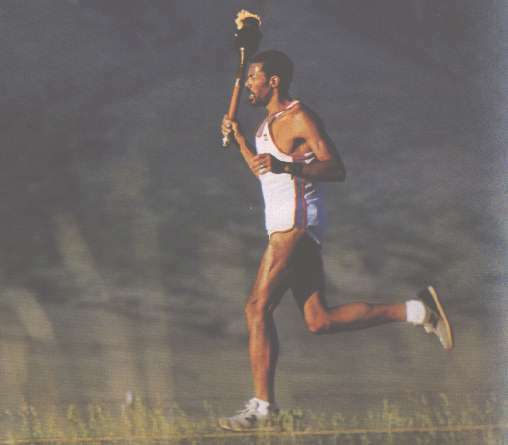 The torch relay began its 15,000 kilometer journey on a rainy morning, 8 May 1984 at the United Nations Plaza in New York City. Olympian Rafer Johnson hosted a short program before Gina Hemphill, granddaughter of 1936 Olympian Jesse Owens, and Bill Thorpe. Jr., grandson of 1912 Olympian Jim Thorpe, became the first of 3,636 torchbearers. 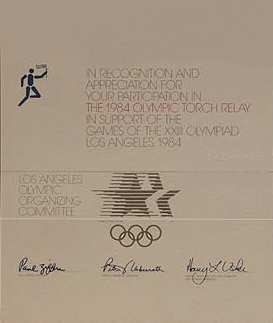 About two hours after the relay began, the Soviet Union announced that if would not accept the invitation of the LAOOC to participate in the 1984 Games. The news stunned the LAOOC staff, and observers wondered what effect the announcement would have on the relay. But the Soviet announcement seemed to have little effect on the large crowds that began to line the streets of their communities to witness the passing of the torch relay. While enormous crowds turned out to see the torchbearers run, the support caravan and the relay support staff were at full speed putting into effect all the logistical details for the relay. Back at the LAOOC administrative headquarters, members of the relay staff double-checked information received from each of the YLK runners and gathered new information from runners assigned to kilometers during the latter portion of the run. Approximately one month before each YLK torchbearer was scheduled to run his or her kilometer, the LAOOC sent a letter verifying the kilometer assignment (location), requesting medical information and instructing the runner to report to an assembly area wearing the official uniform. The letter also informed the YLLK participant that a member of the LAOOC would be contacting them within five days of their scheduled run to verify lastminute details and give specifics regarding the assembly point. The actual relay support staff began its week with a planning meeting which was attended by new cadre runners and Pioneer drivers reporting for their one-week shift. The runners and drivers were given instructions for the week during an orientation session conducted at an assembly hotel near their particular start point along the relay route. The support caravan was allowed no closer than one mile to the core caravan, since a group of more than 30 vehicles would cause traffic tie-ups and cause additional problems and delays for the relay. Operations continued as planned throughout the relay. 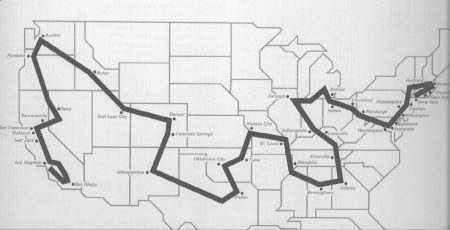 More than 5,000 AT&T Pioneer staff members assisted with details such as obtaining permits and locating campgrounds in their hometowns and also lending valuable help by taking VLK runners to the correct position along the relay route. In addition, they assisted with distributing uniforms and instructing VKL runners in the proper use of the torch. LAOOC advance staff continued their role of providing a sound foundation for the caravan by preceding the relay by approximately one week and coordinating last-minute details before the torch´s arrival. The actual running of the relay proceeded smoothly throughout the 82 days. The logistical success of the relay not only is attributable to detailed planning but also to a fair amount of good luck. While bad weather, traffic and unexpectedly large crowds caused some delays for the relay. no major problems occurred, and the earlier decision by the LAOOC to allow seven hours of down time per night allowed the relay enough flexibility to stay on schedule.